Last night, Khogyani district of Ghazni province fell to the Taliban for the second time in a week. Senior district leaders and acting police chief have been tragically martyred. It's clear to me that the government don't will to defend Hazaras. The massacres of Western Kabul, Paktia, Mirzaolang,Ghazni,Uruzgan, & Jalrez r clear indications of this unwillingness. نیروهای کماندو و مهمات در مرکز ولسوالی پایین می شوند. حدودا سه ساعت تا جبهه جنگ راه است. سلاح های کمکی دیروز تا هنوز هم به جبهات نرسیده. As we get closer to presidential & parliamentary elections in Ghazni, Taliban’s attacks on Hazara-dominated districts intensified. 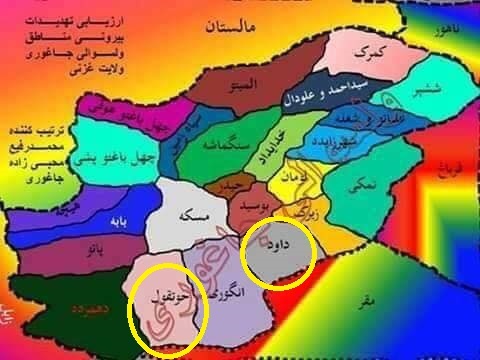 Last night, Taliban attacked Jaghori district from two directions, heavy battle ongoing in Hotqol area, two other key places fallen: Zirak & Dawood. ۸ صبح، کابل: مسوولان محلی در ولایت غزنی تایید می‌کنند که گروه طالبان ساعت سه بامداد شب گذشته، از دو استقامت بر مرزهای ولسوالی جاغوری حمله کردند. چطور است که خلیلی تا قبل از رفتن به ایران هیچ صدایی ازش بلند نشد, حالا رفته ایران از دور شیعه شیعه میکنه. جناب رئیس شورای عالی صلح یکبار ندیدیم کمتر از گُل به طالبان گفته باشی, منتظریم ببینیم چطور بینی طالب را به خاک میمالی.